Chiropractic techniques fit into 3 basic models based on the three body systems primarily addressed by chiropractors. 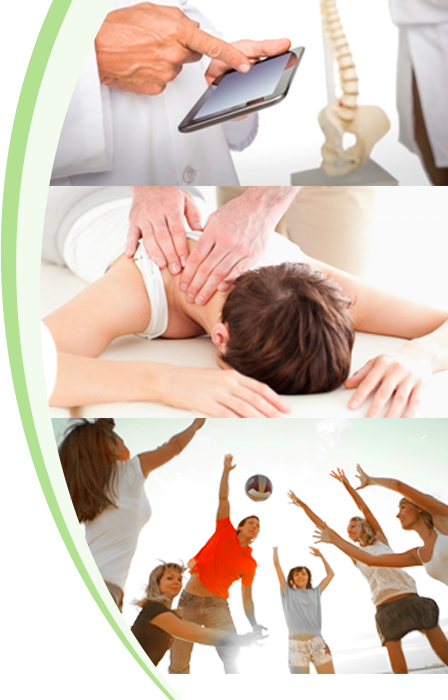 Chiropractic intimately involves itself with the skeletal system, the muscle system and the nervous system. Therefore, while all chiropractic techniques involve all three systems, the techniques themselves can be differentiated from one another based on their method of assessment and their method of correction. Segmental or skeletal system centered chiropractic techniques adjust vertebrae that are not in their optimum position back to a more normal position and, in so doing, affect the nervous system first and then the muscle system next. Postural or muscle system centered chiropractic techniques first involve putting tension or relaxation within the muscle system in order to allow an easier structural adjustment to take place. In so doing, this approach involves the muscle system first which then affects the skeletal system and then, finally, the nervous system. Tonal or nervous system centered chiropractic techniques are not muscle or bone based but rather focus on the nervous system and the related changes in a person’s physiology. As such, tonal chiropractic techniques look at the nervous system first and the doctor’s input into the nervous system then affects the muscle system which, in turn, affects the skeletal system. Since all three technique models work and produce good results, why would we prefer a tonal approach? The answer comes in understanding how the interference to a person’s nervous system takes place to begin with. This phase of your care will be addressing the structural misalignments that where seen through our postural analysis software and also X-Ray. This part of your care requires specific chiropractic adjustments with spinal remodeling exercises which include our wobble chairs and traction units. Also home equipment and video exercises will be utilized. The purpose of Maintenance care is to optimize health, prevent conditions from developing, provide palliative care and minimize recurrence or exacerbation. Health development is our advanced program that allows practice members to grow their health with lifestyle changes that they embrace. Have you ever watched a good guitarist tuning his guitar? He picks up his instrument, and starts to play. Then he screws up his nose because he hears a “bung” note (that no-one else heard). Next thing you know he has stopped playing and is crouched down listening intently to one string as he gently and gradually adjusts the tuning peg. Then he carries on as if nothing happened. If you’ve seen a guitarist lately, you may even have noticed him pull out a little electric gizmo that he plugs his guitar into, which actually tells him when he’s found the right note! So, what is he doing while he is winding or unwinding that small peg on the end of the guitar string? The amount of tension in the guitar string determines the note and hence the tune that plays when you pluck the string. The skill of the musician is to be able to tune the guitar to make a beautiful noise. Now try to imagine a funny looking guitar: This one has pegs at both ends of the string, so that you could change the tension in the string from either end of the guitar. There is also an extra peg right at the tip of the neck of the guitar which can also change the tension of all the strings. What we have just described to you is an analogy for the relationship between your spinal column and your spinal cord. The “pegs” on the guitar are represented by small ligaments which actually hang the spinal cord within the spinal canal. These ligaments are few in number (about half a dozen at both ends of the spine), and only attach between specific vertebrae, and corresponding sections of the spinal cord (central nervous system). At the same time though, there is also a low-grade “wave” of radio frequency traveling up and down your spinal cord that determines the “mood” or “tone” of your central nervous system. This affects your level of consciousness and awareness, your mood, and the slower metabolic and hormonal functions of your body. Adjustments aim to remove any blockages to the fast acting messages traveling up and down the spinal cord; and at the same time rebalance the overall frequency at which the nervous system is operating. Scientifically speaking, your spinal cord is a thick string of pizo-electric gel (electricity conducting jelly). The frequency it is working at is determined by the amount of tension and/or torsion being placed at either end of the “string”. Just like the guitar string, the tightness of the cord determines the tune that is being played. 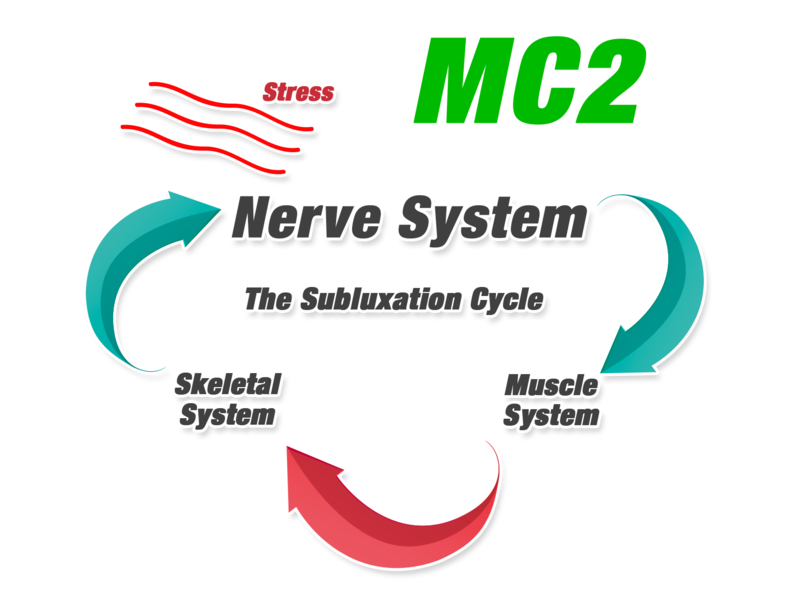 MC2 differs from many of the other chiropractic techniques in that it focuses a lot of attention to the “tuning pegs”: The strategic and vital connection points between the spinal cord and spinal column. As we gently and methodically adjust these areas of your “guitar string” (spinal cord), we are changing the degree of tension in the central nervous system in an effort to change the notes that result. Hence, the skill of the Chiropractor is to be able to tune your spinal cord to find some more beautiful notes. That is, a better level of tension. When many people get up straight after an adjustment, they comment on how their vision seems clearer, the light or view seems sharper, their head feels lighter, there body feels looser etc. These are all reflections of your central nervous system now operating at a better frequency. WHAT SHOULD I BE DOING AND FEELING DURING AN ADJUSTMENT? Here is what you should be focusing on during an adjustment to maximize your body’s response and improvement: 1) Focus your awareness on the area of the spine where your Chiropractor has adjusted with the Integrator. Passively observe any spontaneous movements or sensations in that area or elsewhere. 2) If you sense any gentle movements of your head, neck, arms or legs; don’t be afraid to slightly accentuate and increase the stretch that they are creating in that area. 3) Quietly take notice of any changes in your body’s sense of tension. 4) Work towards developing a breath that produces a wave-like sensation moving up and down your spine, by starting your breath in low down in your abdomen and then filling your breath gradually upwards till it fills to the top of your chest. 5) Try to increase and accentuate the depth of your breath into the area where you have been adjusted while keeping your breath slow, rolling and easy. 6) Enjoy any other “nerve” sensations such as areas of warmth, tingling, twitches, or shooting sensations (not pain). that’s ok. mc2 require that your body responds in fairly organized and coordinated ways in order for the therapeutic response to be significant. did you ride a bike perfectly the first time you got on it? some will respond to these techniques straight away. others will take a few “lessons” before they “catch on”. if you’ve always played tennis and you now go and play a game of squash, even though they seem similar, they use different muscles and stress different ligaments and tendons. similarly with these new techniques, even though the end result is pretty much the same as any other kind of adjustment… the manner in which your body achieves this change is somewhat different. the reason some people are sore after the first time they have this adjustment is because different muscles, nerves and/or soft-tissues will have been stimulated. Mc2 Is focused on helping your body to better look after itself: As such they actually work better when your body is given some time to respond after each part of the adjustment is delivered. In a sense we do as little as possible to get your own body to do as much as possible. HOW DO I KNOW IF I’M GETTING BETTER? Low back pain can come from out of nowhere. As a yoga teacher I was surprised after being evaluated by Dr Andrew Leach that poor posture was part of my problem. His professional spinal adjustments have relieved my pain and thanks to the posture correcting exercises I am improving. Dr Leach treats the whole patient by sharing holistic information and encouraging the patient to be in control of their own health. I feel blessed and thankful towards Dr Andrew Leach for his expertise and knowledge. I had experienced sinus flare ups and really bad migraines but after seeing Dr Leach I have made the decision not to take medicine again. For many years I have lived with chronic pain conditions. Five weeks into being treated by Dr Leach I am now off prescription pain medications and gaining more mobility in my spine and joints. I am immensely grateful to Dr Andrew for his gentle, caring, holistic approach in helping me. I have not felt this good in many years. I came to Dr Leach with a very sick child and after only two months have seen amazing results! So thankful that God placed him in our life! People of all ages consult Chiropractors for many and varied problems as well as back pain. Many parents bring their new born infants, rapidly growing toddlers, accident prone children and hectic teenagers for regular spinal check-ups. People with neck, back, shoulder, hip, knee, ankle, elbow, wrist, muscular and sporting injuries can all be seen visiting chiropractic practices. Poor sleep, colic, bedwetting, allergies and asthma, ear infections, hay fever and sinusitis, headaches and migraines, indigestion, menstrual problems, infertility, chronic fatigue and fibromyalgia, multiple sclerosis and Parkinson’s disease, epilepsy, sciatica and neuralgia are among the many problems which have been found to respond to spinal care. A consultation with the chiropractor will detect whether a program of adjustments may help in these cases. People also attend for different reasons or with different goals in mind. Some people are purely interested in pain relief and will visit for a minimal number of treatments, only to return with a future injury. 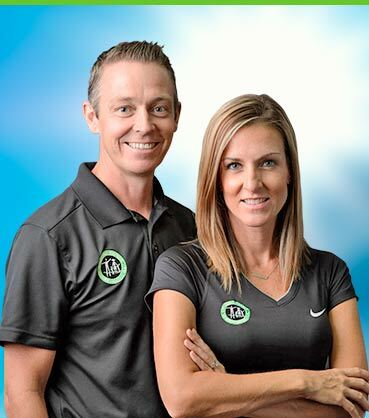 Others are also interested in fully correcting and rehabilitating their injury: This involves ongoing adjustments plus participation in exercises, lifestyle modification and education. Many people upon completing corrective management also wish to continue with preventative programs, which include regular ongoing chiropractic ‘tune-ups’. All practice members are encouraged to participate in education, to help them to become more proactive in their health care. 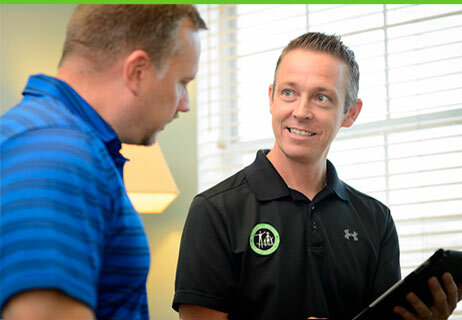 Many practice members appreciate the value of chiropractic care as part of a balanced wellness program, and enjoy the feelings of health and wellbeing received from regular adjustments.